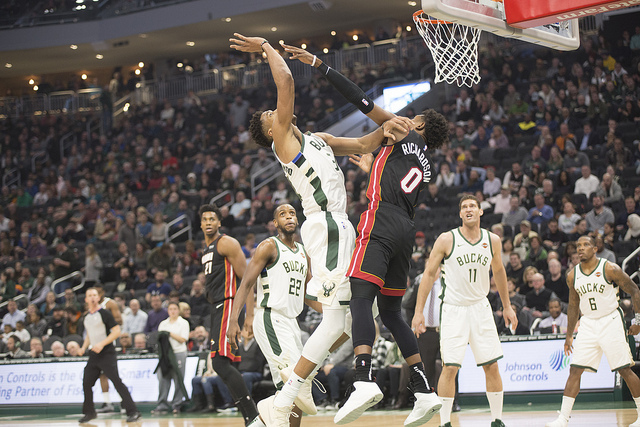 The Bucks snapped their six-game losing streak with the Heat on Tuesday night, their first win against Miami in over two years. Published Jan. 16, 2019 at 8:01 a.m. The Miami Heat have had the Bucks' number for the past two years. Not only did the Heat pull off an impressive 94-87 win against the Bucks during their previous meeting on Dec. 22, holding Giannis Antetokounmpo to just nine points, but the guys from South Beach had won six straight against the Bucks in the past two years. Milwaukee coach Mike Budenholzer looked to snap that streak on Tuesday night – and with a strong home court advantage and fixing their flaws from the December meeting, the Bucks snapped their losing streak against Miami with a huge blowout win, improving to 31-12 on the season. 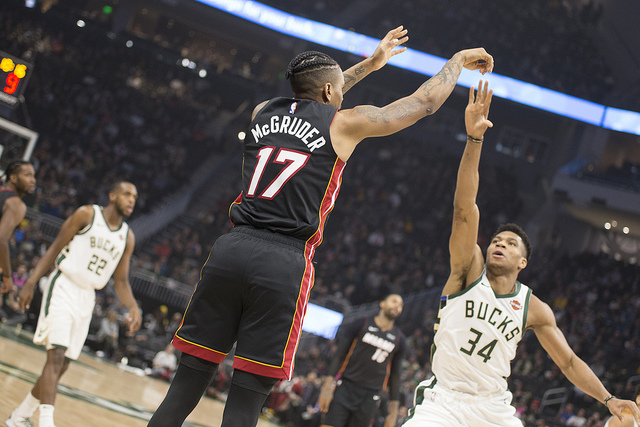 Here are our seven favorite things from the Bucks' home win against the Miami Heat. It's hard to believe that, as improved as the Bucks have been in the past couple seasons, they haven't beat the Heat since just over two years ago. 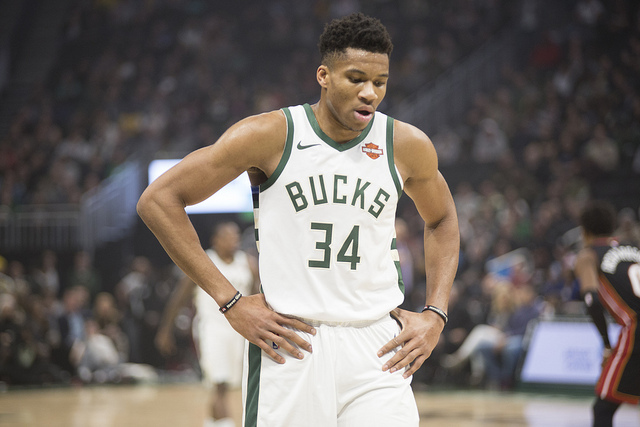 Going into Tuesday night's game, having lost their last six matchups against the Heat, the red hot Bucks didn't dwell on the past in their approach. 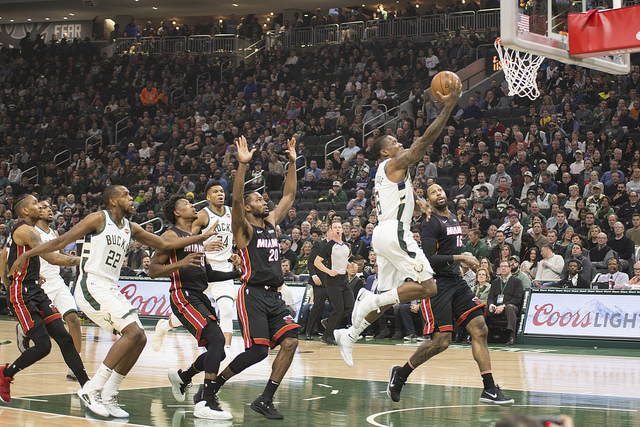 The Bucks looked confident from the tipoff and looked like a team with the second best record in the NBA – not like one that was going to lose a seventh straight game to Miami. While many expected Milwaukee to win the game, not many expected them to do so with a 38-point margin of victory. 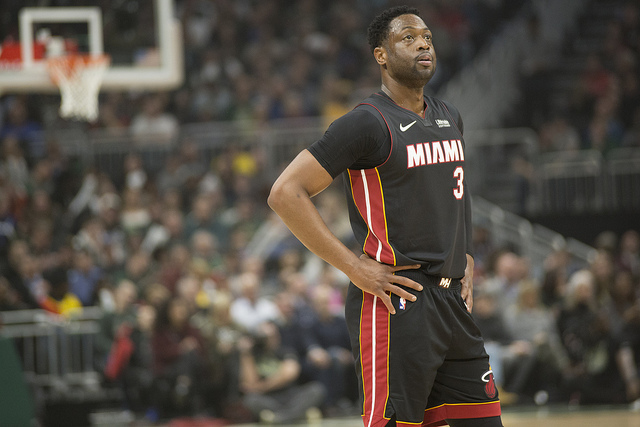 Although the Heat are scheduled to return to the Fiserv Forum on March 22, Tuesday marked night one of Dwyane Wade's farewell tour in Milwaukee. The former Marquette star spent a lot of time next door winning basketball games at the Bradley Center and even had a couple iconic moments in Milwaukee during his professional career – including his no-look pass to LeBron James' tomahawk dunk, one of the most memorable images during the Heat's Big Three era. Wade was admittedly a little emotional when watching the footage of the Bradley Center's implosion on Sunday, and although fans in attendance were rooting for a Bucks' win, Dwyane Wade was met with a warm welcome from the city whenever he checked into the game. Although Tuesday was Wade's first time playing at the new Fiserv Forum, his name still hangs in the rafters – and he surely took a trip down memory lane when he stepped on the court. Although he scored just 12 points, the Greek Freak improved on his last performance against Miami where he only totaled nine points. The Heat continued to defend Giannis with physical play, but that didn't stop him from tallying a triple double (12 points, 10 rebounds, 10 assists). Giannis also had three key steals throughout his performance. While Miami thought they had the blueprint to stop Milwaukee's MVP candidate, he found other ways to help the Bucks get the big win. The Bucks went into Tuesday night with the league's best home record and that remains unchanged going into Wednesday. Milwaukee is now 20-4 at home, just one game behind Toronto for the top spot in the East. With the way the Bucks play at their new arena, home court advantage is looking more and more important for the playoffs. One big difference between the Bucks' success and the Heat's mediocrity this season is the ability for each of the teams to stay healthy. The Heat are currently without their starting point break, Goran Dragic, who is out due to a knee surgery, and the team has been without a lot of their starters the entire season. On the other hand, the Bucks have been able to stay relatively healthy throughout the year. The Bucks are definitely crossing their fingers that their good luck on the injury front continues into the playoffs. Perhaps more than Dwyane Wade, only one person not wearing a Bucks uniform was able to steal the show on Tuesday. Milwaukee County Transit System bus driver Irena Ivic went viral on a national scale this month after she stopped her route to save a baby who was unattended on a busy street. 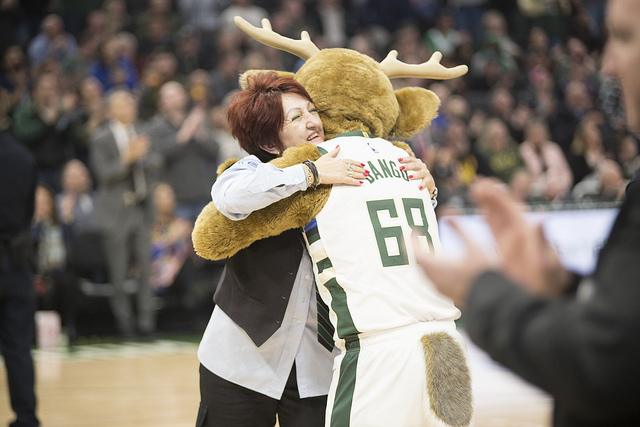 The Bucks gave thanks to Ivic's heroic act, and the crowd left their seats to give her a standing ovation. 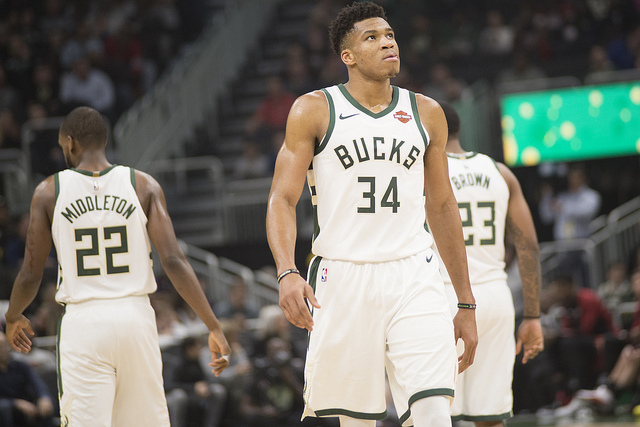 Hopefully the Bucks can ride the momentum from their blowout win against Miami as they travel to Memphis for a game against the Grizzlies Wednesday night. Back-to-back games are always tough, but thanks to Tuesday's sizable win, Giannis and the rest of the starters were able to play limited minutes to help keep the starting five fresh for the Grizzlies. Memphis has the second worst record in the Western Conference so hopefully the Bucks can walk right in and get the road win before they travel to Orlando on Saturday.